We view sales success as the result of the interactions of various factors: sales strategy, structures and sales processes, corporate culture and the professional qualification of your sales staff and managers. That's why we analyze, advise, support and train your sales force systematically and pragmatically, taking all factors into account. We want you to achieve the best sales result possible. Our sales professionals and consultants are former sales managers themselves and know the sales department inside out. They speak your language and know all individual opportunities and pitfalls of sales in various industries. By the way, we are convinced that (almost) every market shift creates new opportunities. They must, however, be recognized. We help you to take advantage of these opportunities and convey these ideas to your sales staff. We differentiate between operational sales and strategic sales management. While operative sales and distribution is mainly focused on generating and exploiting as many sales opportunities as possible for the company, retaining existing customers and making optimal use of the relationships, attracting new customers, etc., strategic sales and distribution management is geared towards securing and increasing the company's long-term market success. How do we position our company (product) in the market? How do we turn our customers into true fans of our company? How do we develop a nose for new markets? How do we organize an excellent and lean distribution system? The answers or measures to these questions are based on our holistic K&P consulting concept, which we have developed in numerous sales, strategy and change consultancies. The K&P consultant triangle. 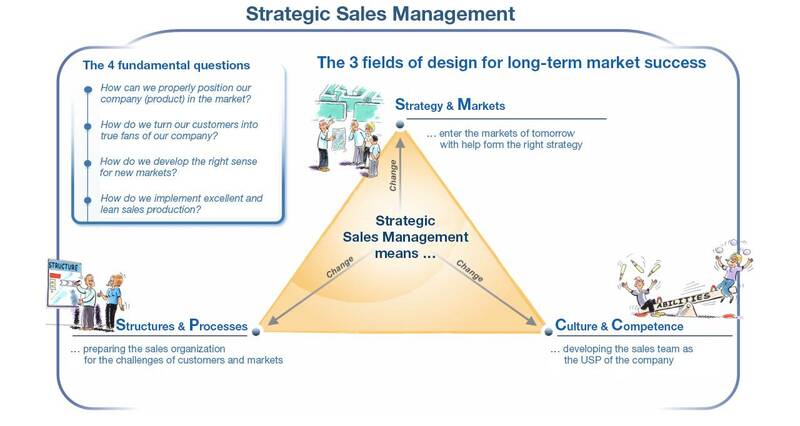 It shows the 3 design fields for strategic sales management. If a company (e.g. in mechanical engineering) wants to position itself on the market as a problem solver and turn its customers into true fans, it is undisputed that it must offer the right product and service portfolio of the right quality, to a very well-defined target group. Branding and price strategy also must underpin the desired positioning in such a way that, at best, even the competitors' customers communicate when they will finally change suppliers (design field strategy and markets). 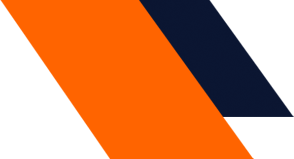 If we take a look at the K&P consultant triangle, it immediately becomes clear that measures at the strategic level alone are not enough to ensure the desired success. At the same time, both the sales processes, as well as the competencies and spirit of the sales team, including customer service and application technology, must fit the desired market positioning (and vice versa). 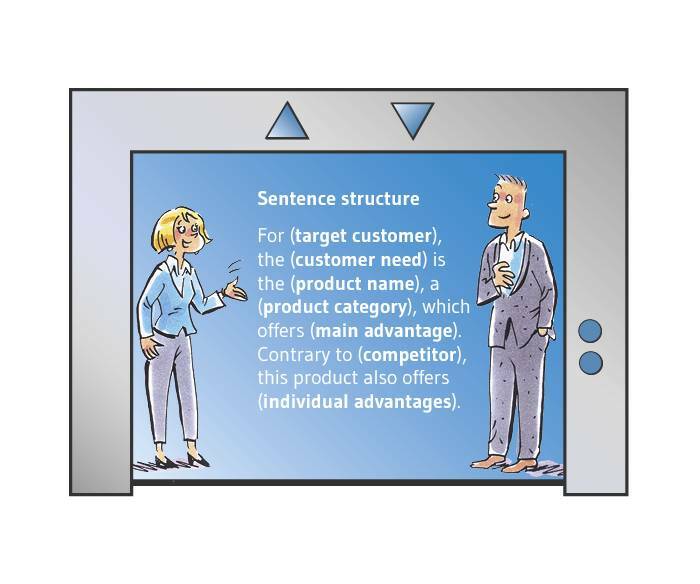 Even with the best product, customers do not become fans if inquiries are not answered quickly enough, the service technician brings the wrong parts with him or the customer is passed on from pillar to post in the event of a complaint (design field structures and processes). And if the sales team is not in a position to arouse enthusiasm for the high-quality machines and to sell the added value of expert advice, as well as an individual and needs-oriented solution to the customer, the company will not be able to justify its sales and price expectations in the market (design field culture and competence). This small example can be extended at will (e.g. with a nose for new markets) or transferred 1:1 to a provider for standardized services in the lower price segment. The message remains the same: No matter which goals you want your sales team to achieve in the market long term, you should always consider all three fields of strategic sales management. What lies behind the K&P sales triangle? Which markets do we want to develop in the future? With which service portfolio? How do we want to position ourselves in the market and which market development strategies do we use to achieve our sales and corporate goals? With these and similar questions, strategic sales management a focus within corporate strategy. Answers to these questions can be designed with the following topics and approaches. The central question for this field of design is: "How do we make our sales organization fit for the future requirements of customers and markets? When products and services, as well as processes and organizational forms, of many companies become increasingly similar, the employees of a company often represent the only noticeable difference in the market. How can the sales team develop into a recognized unique selling point (USP) in the market? In order to achieve this, a company must address the following topics and challenges. How do you set up your distribution? How agile is your sales force - Are you ready for the future? How do we develop the right nose for new markets? How do we position our products correctly in the market? How do we organize an excellent and lean distribution? The sales check: How fit is your sales force for the future? When we work with you, you will receive a coherent concept on how to successfully align your sales organization. We will check how well your sales organization is positioned for the future and identify the need for action in your sales organization, together with you. We will develop and discuss possible solutions for your company and draw up a plan for the gradual change of your sales force. A well-thought-out elevator pitch enables you to demonstrate the core benefits of your product, service or even your own ability in just a few words. This is unbeatable when it comes to marketing and self-marketing purposes. Download the appropriate method map! Ensure that you regularly discuss strategic issues with your sales team and do not forget to reflect on teamwork. Too often, our daily lives are characterized by the figures, data and facts. Take the time to discuss all questions with the team on a regular basis. When the sale turns into an encounter between customer and seller, both are satisfied." Go to topic overview More about the topic "Agility"